As with the Empire State manufacturing region earlier this morning, economists got the negative sign correct, but missed on the magnitude. The Bloomberg Econoday Consensus estimate was -1.0 in a range of -4.0 to +3.0, but the headline number came in at -4.5 slightly below any economist's prediction. Contraction is seeping into the Mid-Atlantic manufacturing sector. 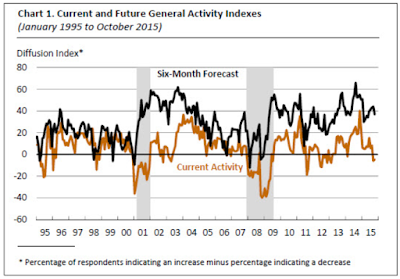 The Philly Fed's index for October, at minus 4.5, came in just below Econoday's low-end estimate. This is the second drop in a row but, more importantly, contraction is now appearing in many of the report's specific indexes including new orders which, at minus 10.6, fell 20.0 points from September. Unfilled orders, at minus 11.7, are extending their long contraction while shipments, at minus 6.1, are down 19.9 points from September. Employment, at minus 1.7, is now in contraction and down 11.9 points in the month. This report confirms the Empire State report released earlier this morning and points to accelerating declines for manufacturing, a sector that appears to be getting hit harder and harder by weak foreign markets. The indexes for current new orders and shipments showed notable deterioration this month, with both indexes falling below zero, marking the first negative reading for the new orders index since May 2013. Indicators for delivery times and unfilled orders were also negative. Thirty percent of the firms reported a decline in inventories this month, and the current inventories index declined 15 points. 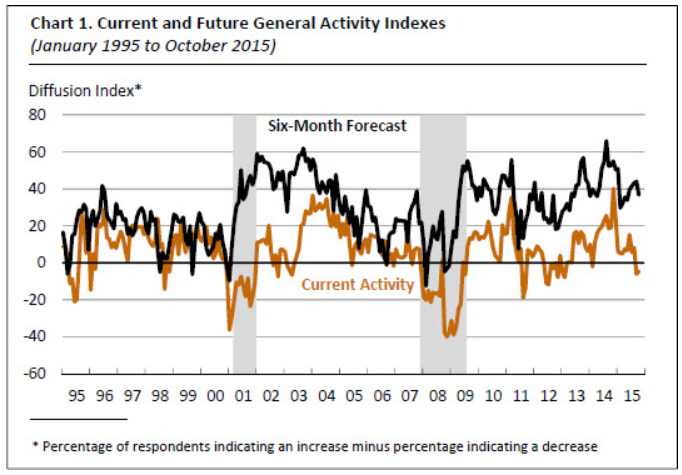 The survey’s indicators for labor market conditions suggest slightly weaker employment. The percentage of firms reporting declines in employment (15 percent) was slightly greater than the percentage reporting increases (13 percent). The employment index declined nearly 12 points, from 10.2 to -1.7. Firms also reported overall declines in average work hours in October, and the workweek index was negative for the first time since May. Thus, two more weak reports today follow the two weak reports from yesterday. The Fed is not hiking this year.